Q: What is our risk of a recession? A: There are many different indicators analysts look at to gain a full understanding of economic and market trends. One of the biggest, and possibly most important, is the US Treasury Yield Curve. The yield curve is the spread, or difference, between long-term interest rates and short-term interest rates. A normal yield curve means the spread is positive (long-term rates greater than short-term rates). An inverted yield curve means the spread is negative (long-term rates less than short-term rates). His team analyzed the last 50 years in the market. During this period, there have been seven recessions. Each recession has one main common trend at the start – the spread between the US Treasury 10-Year Yield and US Treasury 3-Month Yield was less than 0.5%. The reasoning is when the spread is 0.5% it is approaching an inverted yield curve. An inverted yield curve is an indication that the Federal Reserve Board has inflationary concerns and is looking to moderate economic growth and constrain credit creation. A lot of indicators are telling us there is still room for growth in this run. Gross Domestic Product increased by 3.0% in the third quarter. This exceeded the analysts’ expectations of 2.5%. Companies in the S&P 500 are currently reporting earnings, and a large majority are exceeding analysts’ expectations. As of the date I am writing this article – November 1st, 2017 – the spread between the US Treasury 10-Year Yield and 3-Month Yield is 1.23%. 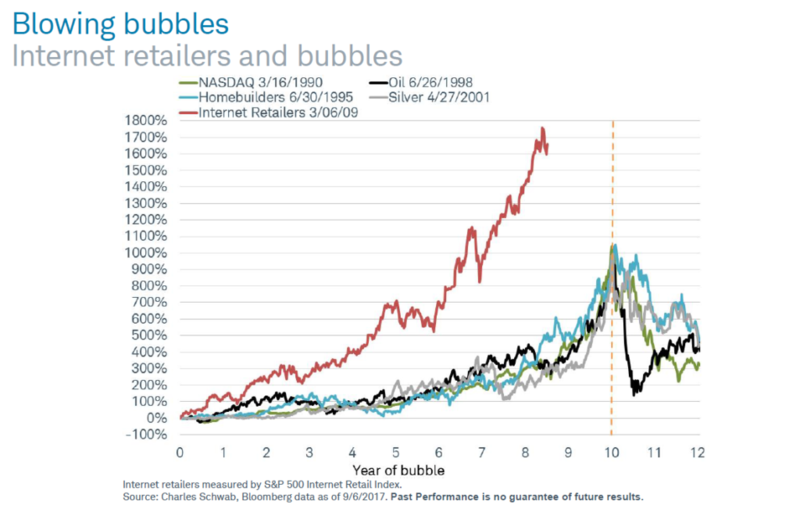 Q:What is the next bubble? 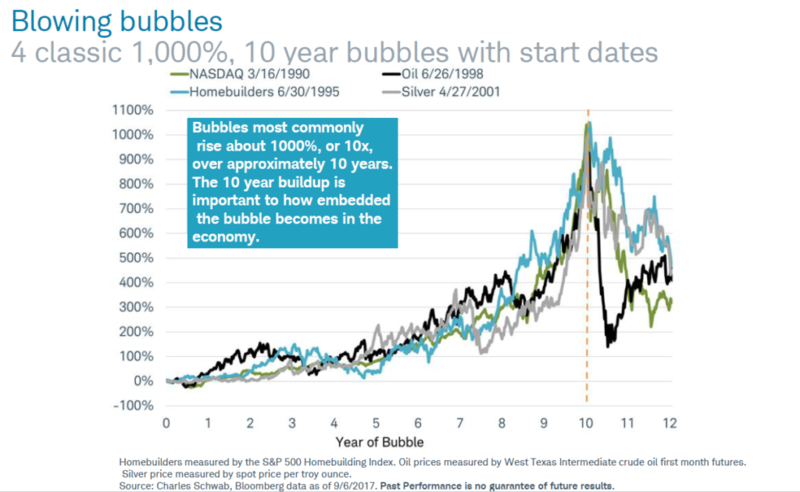 A: The last couple of bubbles have something in common – an increase of 1,000% over a 10-year period. The 10-year period is important because this gives the bubble time to “marinate” in the economy were a fall would influence other industries and parts of the overall economy. 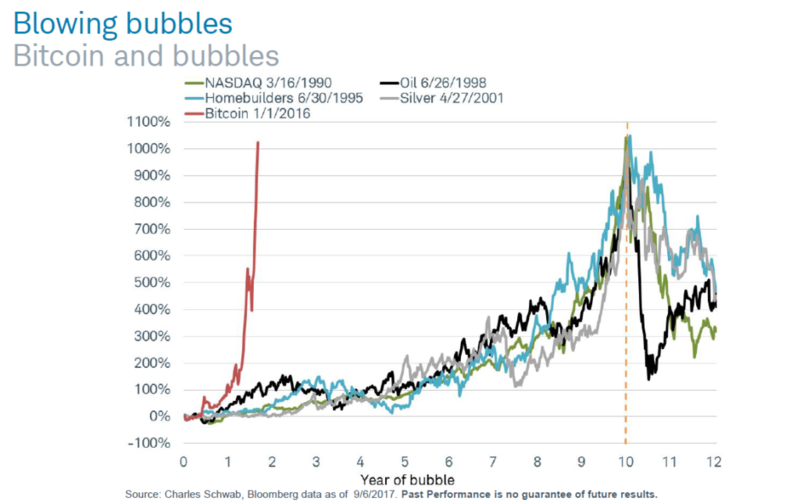 Q: Could Bitcoin be the next bubble? A: Bitcoin has seen a significant increase, but the increase is only over a two-year period. 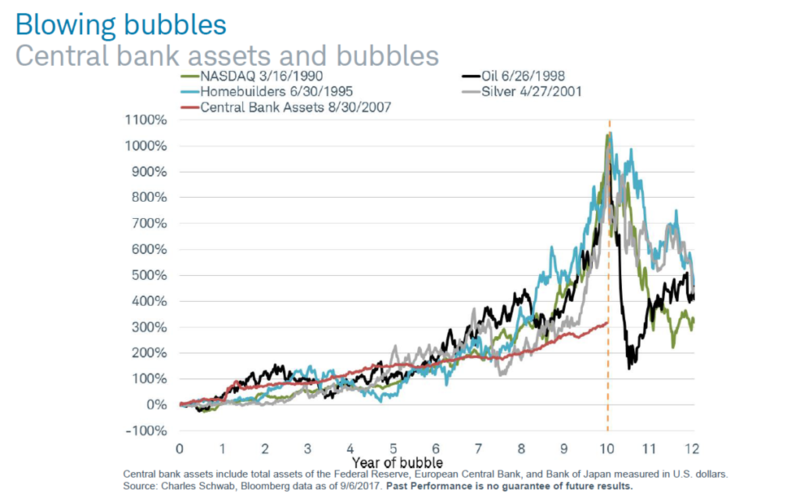 Q: What about central bank assets? A: Central bank assets have experienced an increase for 10-years, but the increase is not significant enough to have a huge effect on other areas of the economy. Q: How about internet retailers? A: This is an area to keep an eye on. We are approaching a 9-year period of significant growth. Kylie and I were talking the other day and we decided it would be helpful to add a section called “Financial Slang” to the end of these market updates. The goal is to detail the main differences between terms that the Wall Street Journal, CNN Money, etc. use that seem like they could mean the same thing but are glossed over so quickly it’s confusing for the average investor. Correction – a correction is the negative movement of at least 10% to adjust for an overvaluation. Corrections tend to have a shorter duration than a recession or a bear market. Bear Market – an extended period of general declines in the market. The market is considered to be entering a bear market when there is a downturn of 20% or more from a peak in multiple market indexes over a two-month period. Recession – a downturn in a nation’s economic activity. The main indicator is two consecutive quarters of falling Gross Domestic Product. Depression – a severe and prolonged downturn in a nation’s economy. Two main indicators are a decline in Gross Domestic Product exceeding 10%, or a recession lasting two or more years.